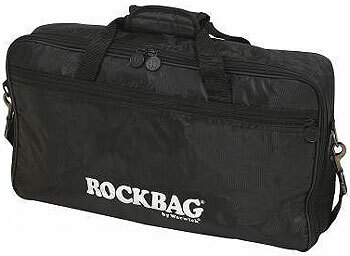 Rockbag RB23060B effects pedal bag - water-resistant Rok-Tek material with 8mm upholstery, 1x removable shoulder belt, 1x long external bag, 1x interior bag, PVC reinforcement, 4x metal feet, 54cm snap hooks. Dimensions: 10 x 30cm (HxD). Colour: Black. Suitable for Boss GT8, Boss GT6, Boss ME-50, Boss ME-50B, Boss RC50, Digitech GNX2, Line 6 Pod XT Live, Toneworks AX3000G, Digitech GNX 3000 etc.